Ask fellow campers about "Mountain Lakes Resort (Membership)" and nearby attractions. We camped here for 2 nights free, and had to listen to a sales presentation. There are 3 (small) lakes around the park. One is stocked with catfish during the warm months, one is stocked with trout for winter/spring. Our site was #25, back-in next to the catfish lake. Most sites are full hook-up with 30 amp service. Only 27 sites are 50 amp. 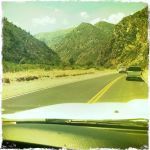 All campsites are first come, first serve, and the 50 amp sites go fast, and are placed sporadically throughout. At the time the catfish lake was closed off, as we were told it was drained and being refilled. Many people were catching trout, good size ones at that. One of the small lakes is just for looks, and no fishing is allowed in it. 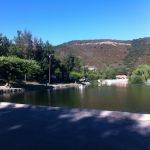 There are many activities scheduled monthly, a small general store, recreation room, bar, restaurant, laundry and restrooms. Our stay was mid-week, Tues, Wed night. The campsites were clean enough but some looked quite uneven. This is a membership only park, and they check applicants for Megan's-law violations for the safety of the children. Everyone was very friendly. No wood campfires but charcoal BBQ's are allowed (small ones provided at the campsites) and covered campfires with Duralogs (wax coated logs) are permitted. Wood fires are controlled located next to beach areas of the lakes for large parties or group fires. We camped at Mountain Lakes Resort (Membership) in a Motorhome. Roads throughout the park are adequate, but make sure you read the map or you will get lost easily. Some turns are tight. We have access to this park through ROD - Resorts of Distinction. 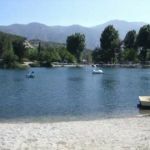 The park is in the San Bernardino mountains and normally has 3 lakes which you can camp around. Most sites are back in and have full hookups. Lots of good walking, on site general store and restaurant. We try to stay here at least twice a year. Lots of fishermen catching trout. We camped at Mountain Lakes Resort (Membership) in a Fifth Wheel. The park is somewhat isolated so when we camp here we do not plan to drive off site. We decided to become members of Resorts of Distinction and this was the first park we visited after joining. Once a member, there are no charges associated with camping--they list a $3 charge for cable TV hookups which are available in most of the park. Really nice "park model" cabins are available throughout the campgrounds for a charge of $49. We were there on a weekend and there were a number of scheduled activities both for adults and kids, excellent live music, a discounted buffet style dinner, and a DJ in the evening in the restaurant, which also features a full bar and an adult center with an adults only pool. We found a beautiful grassy site on one of the two lakes, and enjoyed beautiful views of the mountains and the lake. 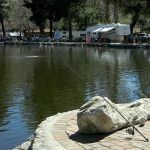 There were a fair number of campers fishing in the lakes--we saw a few catfish and trout. The area is resplendent with trees of every kind, willow, cottonwood, pine, oak, crepe myrtle. This campground is very park-like as opposed to seeming more natural and rural. There is a lot of cultivated grassy area, although only in a small percentage of the campsites. There is an Adult center, a Family Center, a General Store, a restaurant, a reception area and an adjacent grassy area where vendors set up their wares during music events. Participation was high at the music event, and the mood was very cheerful--something we don't always see at campgrounds. The campground has many installed wi-fi stations to provide free wi-fi throughout the park, which seems quite easy to access. Unfortunately due to recent fires in the area, the wi-fi was not working at all. We have access to Sprint, Verizon and ATT on our cell phones and tablet, however, there were a high percentage of areas where we could not get cell service at all. We camped at Mountain Lakes Resort (Membership) in a Motorhome. The lunch and dinner menus were excellent and the food was very tasty. However the Sunday brunch was really disappointing. I recommend you pass on it--I don't believe there is a normal menu for Breakfast. Are you affiliated with Mountain Lakes Resort (Membership) ?